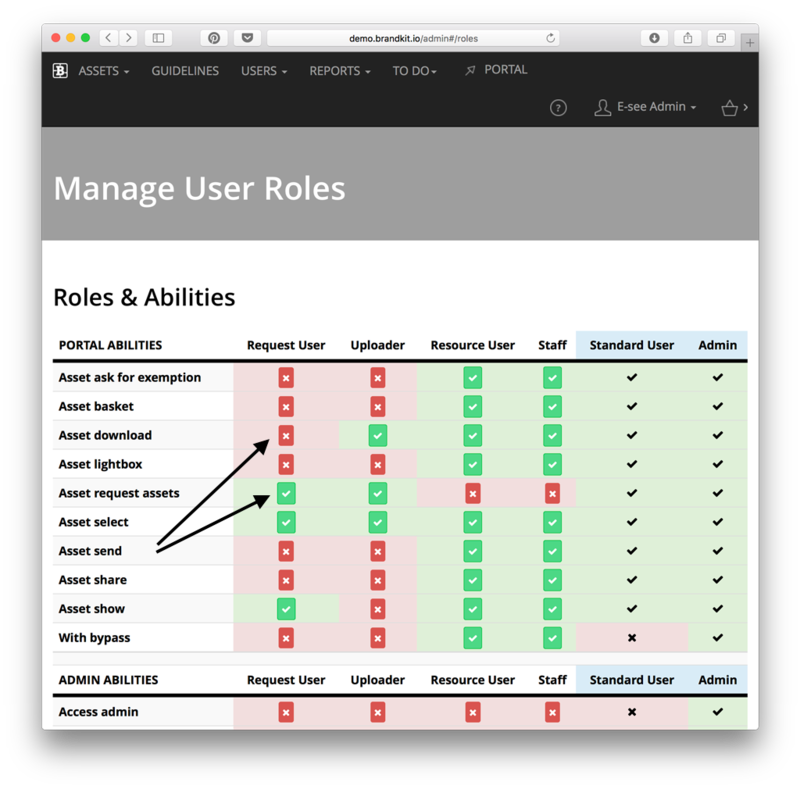 It's possible to configure certain User Roles in your Brandkit account to have to the Request Assets ability only (as opposed to having the Asset Download ability). These days most Brandkit accounts allow one of the two Download abilities, for most User Roles and don't set up a Role with Request Assets only rights. However it may be appropriate for your business to require Approval for each delivery of Assets. In this case you setup a User Role with the Download ability turned off and the Request Asset ability turned on. You can also set the custom Request Assets Role to be the default role for anyone self-registering. The main advantage of Asset Request is that you get to Approve each delivery of Assets. i.e. The user can't Download the Asset without an Admin first approving the request. The main disadvantage is that you have to Approve the delivery, creating inertia for valid users and more work for busy Admins. Request User finds an Asset they wish to use. Request User requests the asset or assets and completes an Asset Request form (essentially their intended use). Brandkit sends an email and in-app notification, to Account Admins, that a new Request has been received (is Pending). Admin logs in and either Approves or Declines the request. If the Request is for multiple assets, the Admin can also remove some assets and Approve the rest, by clicking the 'X' icon in each Asset row in the Request that they wish to remove from the Approval (Or Decline). Upon Approval the Requesting User is sent an Email with a link to a Download Page - where they can download the Approved Assets. If Declined then the user is sent a polite Declined email. Note: If you have Multiple Roles set for some users, Request Users (i.e. a User Role with the Request Assets ability) won't be able to Download without your Approval, unless they have additional Roles that have Download abilities (because Download abilities will always override Request abilities.